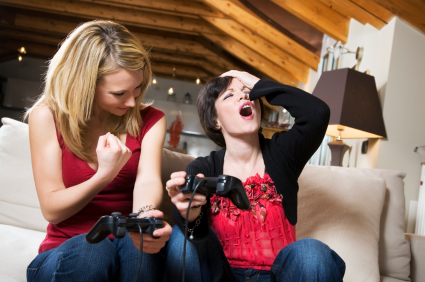 Now I don’t know about you but I don’t know a lot of women that like to play video games it was hard for me a kid being the only boy in the house that would want to play video games. I mean yes, my sisters and I would play video games like Mario Brothers and Mario Kart but it wasn’t competitive in the sense that I could score touchdowns, goals, or even baskets. Mostly because I sucked at Mario Kart. But it was hard for me to get my sisters to play anything that wasn’t racing and level beating. I wanted to play sports and I still find it hard to play basketball, hockey, and baseball with my girlfriend. I love video games and believe or not most girls do to, its their little secret. Maybe your boyfriend or friend never lets you win and that why you don’t like video games but they truly love when you play video games with them trust me. Women just have to admit that they love video games and really guys don’t just want to crush girls at video games they just want someone to play along with them in the game. I not saying play sports games all day with them but it would be nice. Did you know that the video game industry actually wants to hire more women so they can keep the creative minds flowing. I think its a great idea and it might just push more women to understand why men like video games and why they should too, because we all know you do!